I have a feeling that the last two months I’ve just been working and baking. Working and baking! Stress and antistress. Yesterday I had the right anti-stress therapy: three cakes in four hours, and before that an hour shoveling snow. 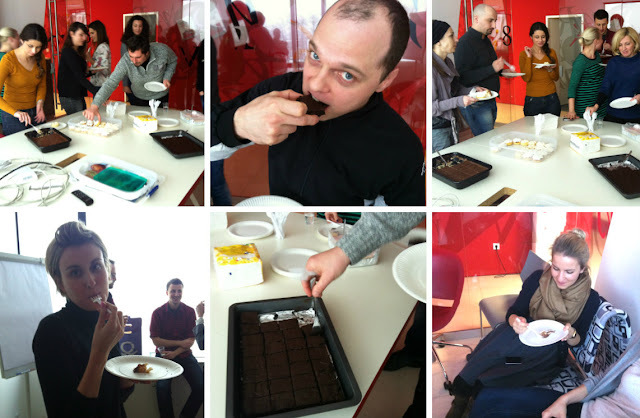 :) The reason: I decided to prepare a belated birthday treat for my co-workers, and we all love sweets. Fortunately, my cakes were a big hit. They even made fun of me saying I shouldn’t have used my birthday as an excuse to have a blog-launch party! To work I took previously tested cakess – except one which I have never prepared before. A brownies recipe by Jamie Oliver. Why not? Everyone loves brownies, and these are super-chocolatey and very delicious. Need I say that we ate all of them? Preheat the oven to 180 ° C, and line the tin with parchment paper. Put a large bowl with the chocolate and butter above another bowl where you boiled water. Melt the chocolate and butter by stirring continuously to make a compact, silky mixture. Add dried fruit if you used it. In another bowl, mix the cocoa, flour, sugar and baking powder and add to the melted chocolate mixture. Mix to unite. Beat the eggs and add gradually to the mixture, mix until combined. Pour the mixture into the tin, smooth the surface and bake for 20-minutes. Now, brownies should be slightly sticky and gooey in the middle, not dry as a sponge. When you see that your surfaces and edges are baked, stab a toothpick into the middle - it shouldn't come out clean. Leave in the tin to cool, and then turn it on a flat surface (in another tin or on a board). Melt the chocolate and butter (I do it in the microwave, you should take it out every 20 seconds and stir not to overheat - but you can also use a double boiler), pour it over the cake and spread over the entire surface. These brownies were the best!!!!! So delicious. Made these and very yummy. Buttery. Substituted butter with half of quantity with salted butter n added 10g more flour- strong flour. All mixed by hand n so easy to do. Will most definitely use as standard jone recipe. Tq for sharing. so so so yummy. Kept the brownies in the oven for a little bit longer than 20 minutes, and they came out beautifully. thank you for the recipe!